October 4th: Spoons/McDonalds/TGI Fridays/couriers and more? 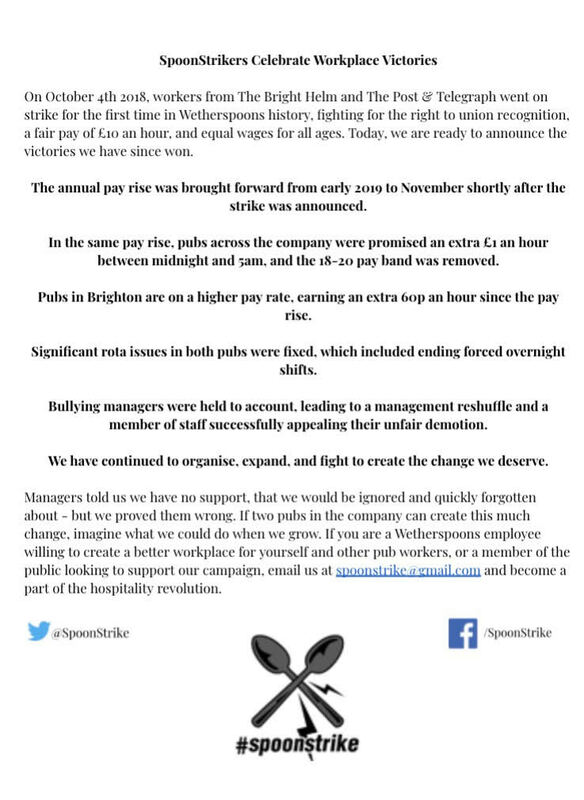 In a historic move, hospitality workers in the McStrike, TGI Fridays Strike and SpoonStrike [JD Wetherspoon] are staging coordinated walkouts to highlight issues of low pay and insecure working in the UK hospitality industry. They are part of a growing movement of workers who face similar conditions of poverty pay, precarious contracts and lack of union recognition. Workers in two Wetherspoons pubs in Brighton, McDonalds in Brixton, Crayford, Cambridge and Watford, and TGI Fridays workers in Milton Keynes, Covent Garden and Stratford in London will be going on strike. Also now apparently endorsed by a branch of the IWGB organising private hire drivers. There'll be a central London rally happening on the day, dunno what's happening elsewhere but you'd hope there'd be stuff in Brighton/Cambridge/Milton Keynes at least. [EDIT: Just found FB events for Brixton, Brighton and, uh, Brighton again.] Anyone got any thoughts, analysis, or whatever to offer? Thanks for the uplifting news, R Totale. I also like that the Fast Food Shutdown acronym is FFS. As in FFS!!! The collective battle cry of those who are fed up and ready to strike. Yeah, I enjoyed that too. 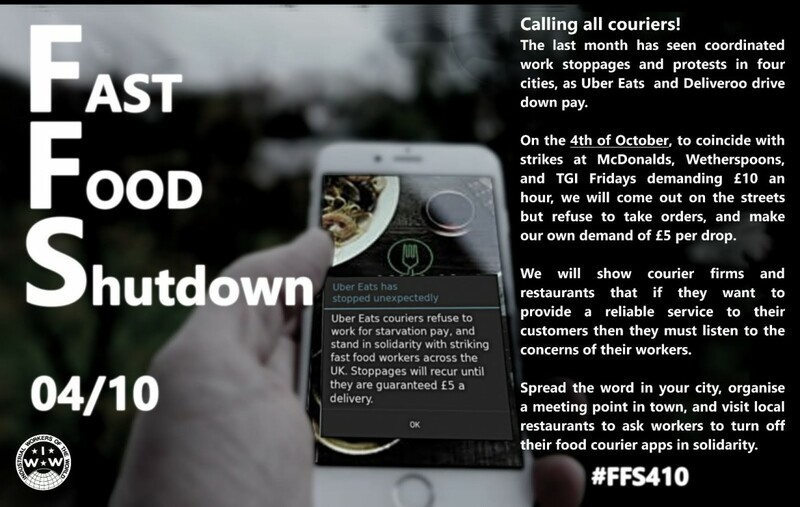 Further updates here: https://notesfrombelow.org/article/fast-food-shutdown-october-4th-preview (as well as the IWW article I've just posted to the news section) - interesting to see that apparently the GMB's taxi drivers section are following the IWW's lead on this one. My brief attempt at an analysis would be that the McDonald's strikes have clearly taken a lot of inspiration from the Fight For Fifteen in the US, and so I suspect that some of the criticisms levelled at that campaign (in short, aiming at dramatic actions to get media attention over building lasting power in the workplace) might also apply to the McDonald's efforts here, but looking at the Wetherspoons strike it sounds like there's been real low-key grassroots organising going on in both pubs prior to the strike vote, and the situation with couriers is different again, it seems like there's been a real wave of self-organised activity in that sector. Workers at TGI Fridays won their well publicised dispute after taking highly effective industrial action and embarrassing the company into concessions. * Re-establishment of the Tronc Committee. (Making sure staff are paid correctly and on-time is critical for any organisation, but in the hospitality sector it can be particularly challenging – not just because of seasonal and irregular working hours, but also ensuring that tips and service distribution are correct and fair.